Yeah, the rumors are true. I have finally taken the big plunge and purchased an amp. In all honesty, I really have treated my QRP operating in an almost religious way. I am a purist. 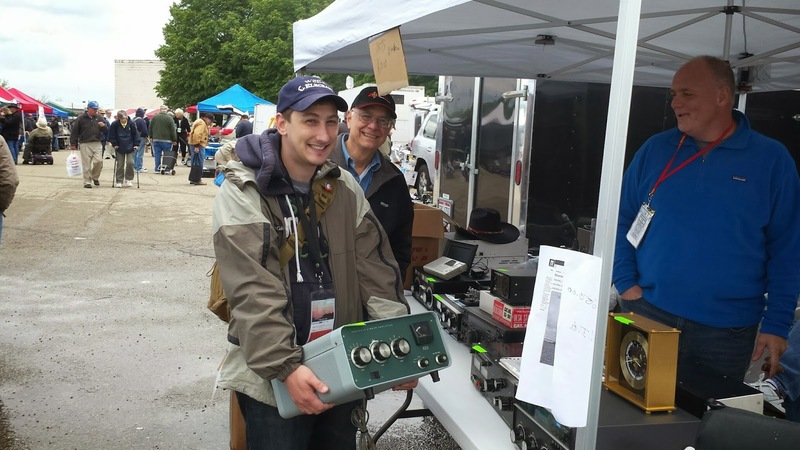 But as you are well aware, my needs and desires have evolved over the years and QRP is no longer the end-all aspect of ham radio it once was for me. Really, this is all for the better, an all-or-nothing approach to most things is not good! So my recent excitement and success with DX drove me towards QRO. First with the homebrew amp for my KX3, then the 590, and now with the new amplifier. As I've seen others say, power is simply another tool in the ham's toolkit. It doesn't always have to be on. The amp is a Heathkit SB-200, good for around 500w on all bands, considerably more on 80 and 40m. This one was in great shape, probably the cleanest one I saw in the flea at Hamvention. The guy had $375 on it and my goal was to keep it under $300 and he came back at $325. I thought it was worth it but I went and got my amp gurus - K0DAS and W0ODS - to review the sale. Rod (DAS) looked over the amp with an eye on wear and tear, and seeing none, gave me the thumbs up. Jeff (ODS) was standing behind me literally whispering in my ear "Buy it! Buy it!" I guess I can't deny that kind of argument!